As quickly as it started, the eruption at Grímsvötn seems to be ending. Ash emissions from the volcano ceased early this morning (Iceland time) and now only steam plumes remain at the crater of Grímsvötn (see below). Even yesterday, the plume had dropped below 5 km (from a previous high of 20 km) as the magma discharge rates dropped dramatically (compare the two images below). The Prime Minister of Iceland has said that her country has moved onto the "clean up" phase of the eruption as all signs, such as seismic tremor, suggest that this phase of the eruption is over. You can see some video of the waning stages of the eruption where Surtseyan explosions dominated the activity, thanks to the magma intruding the water in the crater at much lower discharge rates (thus only forming small, < 1 km plumes). (top) The weak steam and ash plume seen at the crater of Grímsvötn on May 25, 2011. Note the small lake under the plume that fills the crater and the weak "rooster tails" typical of a Surtseyan eruption. Click here to see original. (bottom) The ash plume seen on May 21, 2011. Note the difference in size only 4 days after the eruption started. The Grímsvötn ash itself is still swirling over Iceland, Europe and the North Atlantic, spreading over 800 km from the volcano. Even if Ryanair president Michael O'Leary doesn't believe it exists, the NASA Earth Observatory released an image of the ash over the region. The ash was thick enough to be seen on cars and windows in Norway. However, it should begin to clear rapidly as the eruption wanes. At its height, airports as far afield as Germany were closed, but the air traffic disruptions will likely be over in the next day or so. Even with such a limited ash hazard, there was still a lot of controversy over the closure, with Ryanair trying to use stunts to get the ban lifted, but European officials still played the ash cautiously (which rightly they should). If you'd like to see a retrospective (already) of the ash in Iceland itself, check out this video (Icelandic) from Visir, but thankfully the air is beginning to clear in Iceland as well. It does amaze me that even with the eruption of Grímsvötn waning, there are some news agencies already fear-mongering about the next Icelandic eruption (German). Spiegel Online claims that inflation at Hekla is a direct sign that it will soon have a larger eruption, even though inflation is common at many volcanoes. 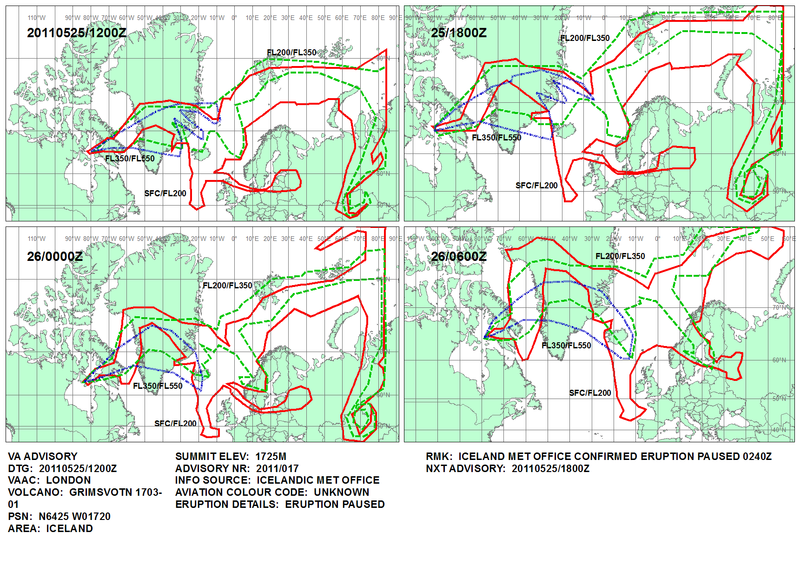 It is inevitable that another eruption will occur in Iceland, likely not in the distant future, but this sort of sensationalism that every Icelandic volcano is posed to explode is just useless (and dangerous). Animated GIF from weather satellite images of the Grímsvötn ash plume punching through the clouds. What amazes me most in this is the "rippling" you can see in the atmosphere as the ash plume appears and the perfect "umbrella" shape to the plume. You can see just how big the initial plume was relative to the size of Iceland in the layered NASA MODIS image and a Google Earth map of Iceland (see below). De Spiegel, when not fear mongering, does have a great gallery of images from the eruption as well. The May 21-22 plume from Grímsvötn as seen from space superimposed on a Google Earth map of Iceland. Top left: The initial ash plume from Grímsvötn seen on May 21, 2011 (click on the image to see original). Compare the size of this plume to the current plume shown at the top of the page. Image by Agust Gudbjornsson.